From v 1.44 the support for CW-operation in the system is considerable improved. if the Internet latency was more than maybe 20-30 ms. With the keyer built in to the Remoterig box that problem is solved when the sidetone is generated locally in the box. Besides the local sidetone there is also a function which mutes the audio from the radio x ms after the dot or dash is sent (lf delay ms). This means that the sidetone generated from the radio will automatically be muted. Even if you can disable the sidetone in the radio there can be annoying clicks or other sounds that can be convenient to mute. The delay can be adjusted depending on the latency. A good start value is the same as the ping time between control and radio QTH. The function is available both in the RRC-1258MkII and in RRC-1258. In the earlier version you must add a potentiometer. and here is the same transmission with the jitter correction activated ( “key delay ms” set to 50 ms). The CW keyer settings is done on the “Keyer Settings” page. The parameters are also described on the Common configs page. Connect the CW-paddle to the PAD jack on the back of the RRC-1258MkII. Pin 1 and 2 (8=GND) in the I/O jack is connected in parallel with the PAD jack for backwards compatibility with RRC-1258. 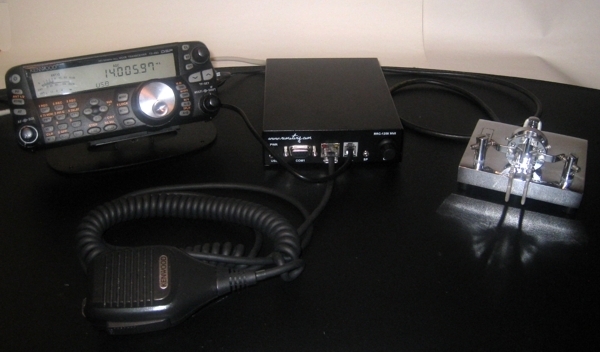 The output from the CW-keyer is easiest available at the PAD Jack (Radio RRC). Use a standard 3.5 mm stereo plug. both tip and ring is keyed. For backward compatibility the keying signal is also available in the I/O jack on the back of the Radio-RRC. Pin 5 is grounded by a FET when keyed. Pin 8 is GND. I both cases the keying is done by a FET-transistor (max 15V 200mA). Down below is a schematic describing how a interface to the PC can be done. There are lot of different solutions on the Internet, but this is very simple and can be implemented in the D-sub housing. No values are critical, just use what you have in the junkbox.